, a learned divine of the seventeenth century, was born in 1607, in the island of Jersey, according to Wood, which an annotator on the Biog. Britannica contradicts without informing us of the place of his nativity. Grey, in his ms notes, says he was born at Rouen, in Normandy, but quotes no authority, nor do we know in what school or university he received his education. For some time, he was master of the college or free-school at Guernsey, and became chaplain to Thomas Morton bishop of Durham, who gave him the rectory of Stanhope, and the vicarage of EgglesclifF, b.oth in the county of Durham. In July 1640, he had the degree of doctor of divinity conferred upon him at Cambridge, by mandate; and was incorporated in the same at Oxford, the November following, about which time he was made chaplain in ordinary to king Charles I.; Dec. 12, 1643, he was installed into the seventh prebend of Durham, to which he was collated by his generous patron bishop Morton. The | next year, August 24, he was also collated to the archdeaconry of Northumberland, with the rectory of Howiek annexed. But he did not long enjoy these great preferments, as in the beginning of the civil wars, being sequestered and plundered, he repaired to king Charles at Oxford, before whom, and his parliament, he frequently preached. In 1646, he had a licence granted him under the public seal of the university, to preach the word of God throughout England. 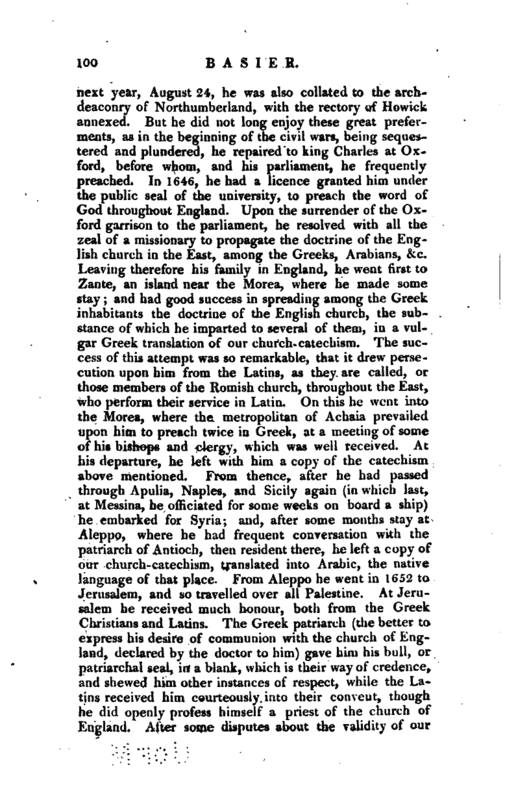 Upon the surrender of the Oxford garrison to the parliament, he resolved with all the zeal of a missionary to propagate the doctrine of the EngJish church in the East, among the Greeks, Arabians, &c. Leaving therefore his family in England, he went first to Zante, an island near the Morea, where he made some stay; and had good success in spreading among the Greek inhabitants the doctrine of the English church, the substance of which he imparted to several of them, in a vulgar Greek translation of our church-catechism. The success of this attempt was so remarkable, that it drew persecution upon him from the Latins, as they are called, or those members of the Romish church, throughout the East, who perform their service in Latin. On this he went into the Morea, where the metropolitan of Achaia prevailed upon him to preach twice in Greek, at a meeting of some of his bishops and clergy, which was well received. At his departure, he left with him a copy of the catechism above mentioned. From thence, after he had passed through Apulia, Naples, and Sicily again (in which last, at Messina, he officiated for some weeks on board a ship) he embarked for Syria; and, after some months stay at Aleppo, where he had frequent conversation with the patriarch of Antioch, then resident there, he left a copy of our church-catechism, translated into Arabic, the native language of that place. From Aleppo he went in 1652 to Jerusalem, and so travelled over all Palestine. At Jerusalem he received much honour, both from the Greek Christians and Latins. The Greek patriarch (the better to express his desire of communion with the church of England, declared by the doctor to him) gave him his bull, or patriarchal seal, in a blank, which is their way of credence, and shewed him other instances of respect, while the Latins received him courteously into their convent, though he did openly profess himself a priest of the church of England. After some disputes about the validity of our | English ordinations, they procured him entrance into the temple of the sepulchre, at the rate of a priest, that is half of the sum paid by a layman; and, at his departure from Jerusalem, the pope’s vicar gave him his diploma in parchment, under his own hand and public seal, styling him, a priest of the church of England, and doctor of divinity, which title occasioned some surprise, especially to the French ambassador at Constantinople. Returning to Aleppo, he passed over the Euphrates and went into Mesopotamia, where he intended to send the church-catechism in Turkish, to some of their bishops, who were mostly Armenians. This Turkish translation was procured by the care of sir Thomas Bendyshe, the English ambassador at Constantinople. After his return from Mesopotamia, he wintered at Aleppo, where he received several courtesies from the consul, Mr. Henry Riley. In the beginning of 1653, he departed from Aleppo, and came to Constantinople by land, being six hundred miles, without any person with him, that could speak any of the European languages. 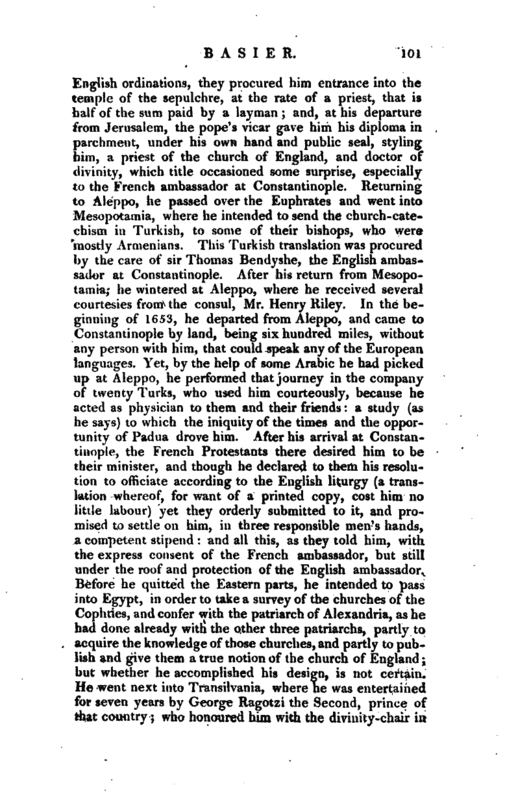 Yet, by the help of some Arabic he had picked up at Aleppo, he performed that journey in the company of twenty Turks, who used him courteously, because he acted as physician to them and their friends: a study (as he says) to which the iniquity of the times and the opportunity of Padua drove him. After his arrival at Constantinople, the French Protestants there desired him to be their minister, and though he declared to them his resolution to officiate according to the English liturgy (a translation whereof, for want of a printed copy, cost him no little labour) yet they orderly submitted to it, and promised to settle on him, in three responsible men’s hands, a competent stipend: and all this, as they told him, with the express consent of the French ambassador, but still under the roof and protection of the English ambassador. Before he quitted the Eastern parts, he intended to pass into Egypt, in order to take a survey of the churches of the Cophties, and confer with the patriarch of Alexandria, as he had done already with the other three patriarchs, partly to acquire the knowledge of those churches, and partly to publish and give them a true notion of the church of England; but whether he accomplished his design, is not certain. He went next into Transilvania, where he was entertained for seven years by George Ragotzi the Second, prince of that country; who honoured him with the divinity-chair in | his new founded university of Alba Julia (or Weissenburg) and endowed him, though a mere stranger to him, with a very ample salary. During his travels he collated the several confessions of faith of the different sorts of Christians, Greeks, Armenians, Jacobites, Maronites, &c. which he kept by him in their own languages. His constant design and endeavour, whilst he remained in the East, was, to persuade the Christians of the several denominations there, to a canonical reformation of some errors; and to dispose and incline them to a communion or unity with the church of England, but his pious intentions were afterwards defeated by the artifices of court of France. Upon the restoration of king Charles II. Dr. Easier was recalled by his majesty to England, in a letter written to prince Ragotzi. But this unfortunate prince dying 'soon after, of the wounds he received in a battle with the Turks at Gyala, the care of his solemn obsequies was committed to the doctor by his relict, princess Sophia, and he was detained a year longer from England. At length returning in 1661 9 he was restored to his preferments and dignities; and made chaplain in ordinary to king Charles II. After quietly enjoying his large revenues for several years, he died on the 12th of Oct. 1676, in the 69th year of his age-, and was buried in the yard belonging to the cathedral of Durham, where a tomb was erected over his grave, with an inscription. His character appears to have been that of a learned, active, and industrious man; a zealous supporter of the church of England; and a loyal subject. His son, John Basire, esq. who had been receiver general for the four western counties, died ou the 2d of June 1722, in the 77th year of his age. 1 Biog. Brit. 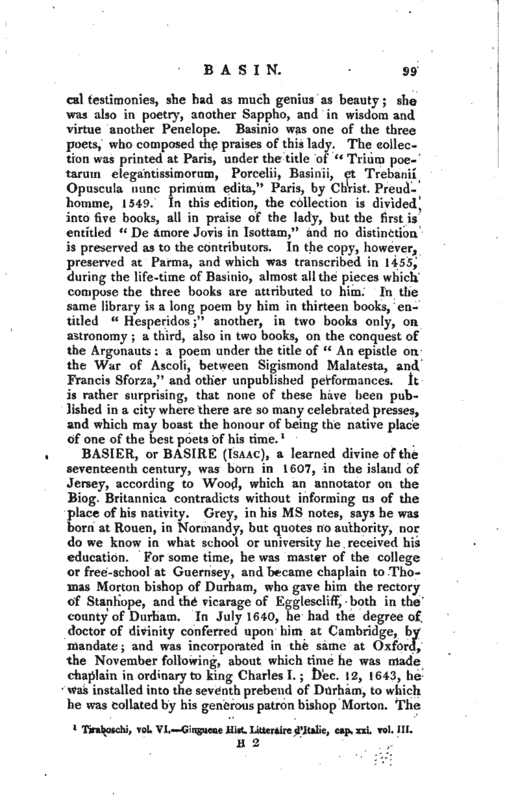 Wood’s Fasti, vol. I. Hutchison’s Hist, of Darhain, vol. II. p. 197.